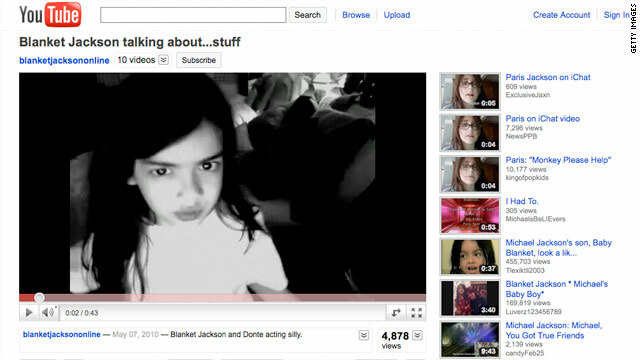 Blanket Jackson and his brother and sister uploaded videos of themselves to YouTube using a camera on their computer. Los Angeles, California (CNN) -- Michael Jackson's children appear to be having lots of fun playing with the camera on their computer. Several home videos, mostly featuring 8-year-old Blanket, were uploaded to YouTube last month, a source close to the family confirmed. The source asked not to be identified because of the sensitivity of the matter. The videos were up for about two weeks in April before older members of the Jackson family realized it and had them removed, the source said. By then, however, other YouTube users had made copies and republished them. Katherine Jackson, who has custody of the children, has been concerned about the public perception of their well-being since a reported stun gun incident in March. A caseworker from the Los Angeles Department of Children and Family Services visited the Encino, California, home where the children live with their grandmother to investigate the incident. The videos offer a rare glimpse of the Jackson kids being kids, which is a contrast to their public appearances since their father's death last June. The three children usually wore masks when seen with their father. The youngest is called Blanket because that is what often covered him in public. The camera that recorded the videos was mounted on top of the computer screen used by the children, the source said. Blanket is seen acting out what appears to be a scene from "Star Wars," while one of his cousins sits next to him. "We have something to show you," Blanket says on the video, displaying his "light saber" skills. He provided his own soundtrack and sound effects. Paris, 12, appears in a short clip that was recorded during an online video chat, the source said. Prince Michael, 13, was not seen in any of the videos found online by CNN. Four cousins, the sons of Jermaine and Randy Jackson, recently moved from the home with their mother to a Woodland Hills, California, condo owned by the Jackson estate, the source said. It was Jermaine Jackson's 13-year-old son who received a stun gun in a package in the mail in February, according to attorney Adam Streisand, who represents Katherine Jackson. "Jaafar opened the package alone in his bathroom and tested it on a piece of paper," the attorney said in March, adding that nobody was hurt in the incident.